Create budgets for your home or office. The budget report subtracts the expense items from the income items and displays the net total. EZ Home and Office budgets are simple but can be very useful. The report can show amounts by the week, month, or year. Any number of budgets can be added and password protected. A budget can also be exported to a PDF file. With 'Select Features' on the Tools Menu you can remove Budgets and other functions to simplify the program. 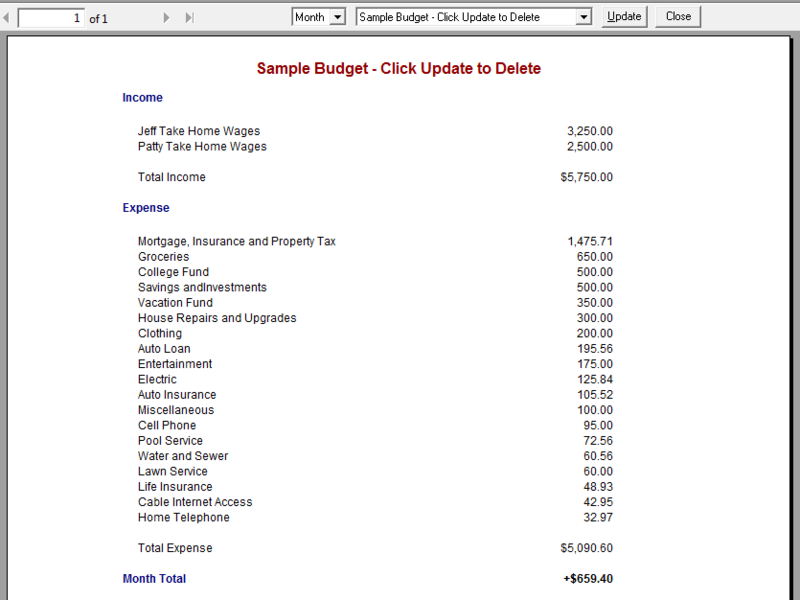 Budgets screen shot and information below. The expense items are subtracted from the income items and the budget total is displayed. Income items can be gross or net (take home). If gross amounts were used, then the tax and other withholdings would be added as expense items. Budget amounts can be prorated and displayed for a 'Week', 'Month', or 'Year' by selecting from the drop-down list. Click 'Update' to add, change, and delete budgets. A budget can be password protected. The report is indented for punch holes. Click on the toolbar, use Ctrl+P, or select 'Print' from the File Menu to print the budget.